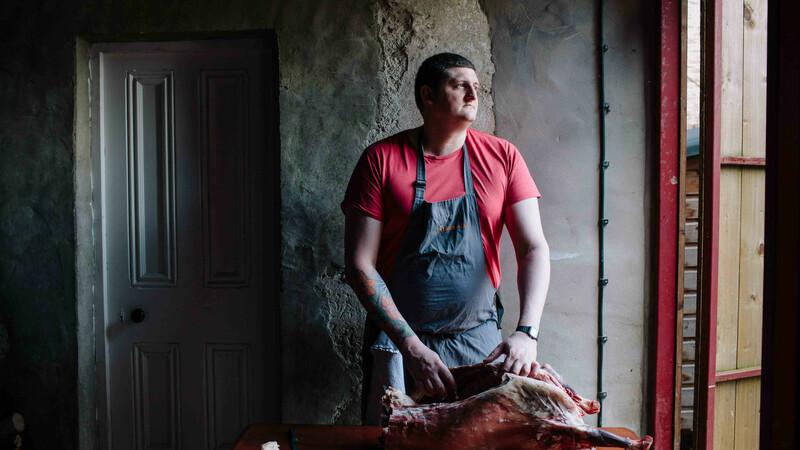 Gareth Ward is chef patron at Ynyshir, a Michelin-starred, four-AA rosette restaurant with rooms which offers dining experiences featuring, in Ward's own northern dialect, 'Alternative British Snap' – food packed with flavour. Ynyshir is located between the Welsh coast and Snowdonia National Park, and Gareth regards the whole of the UK as his larder, sourcing the best ingredients from where he thinks are the best producers and locations. Traditional wagyu beef is all about texture, but in my opinion the flavour is not always amazing. The one we use, Ifor's Welsh Wagyu from Montgomery, is a cross-breed with Angus beef. The wagyu brings that texture and the Angus the flavour, making it incredible and versatile. Prawns and scallops from the Isle of Skye are the best in the world because of the water – it's the perfect temperature. Again, we use tomatoes from the Isle of Wight because the climate is the best in the UK. It's the warmest part and therefore produces the sweetest, most amazing tomatoes. The Midlands is renowned for its pork – I have used our pork supplier, Beedhams Butchers, for over ten years. I've been given a lot of samples from special breed pigs over the last few years, but they've never been nearly as tasty as Johnny's pigs. We get all of our fish line-caught from the coast of Cornwall. That part of the country is incredible for fish. People ask me why we don't use Welsh fish as we are right beside the sea but the quality and consistency is not there - we will never compromise quality for 'locality'. We love to be able to get ingredients from our landscape and during the season (March - June) wild garlic is everywhere around us, from the woods to the fields. You can't beat picking something yourself and using it throughout the year on the menus. We collect samphire, sea aster and purslane from the estuary behind our restaurant. It's marshy and tidal so provides the perfect growing conditions. We collect whatever is in season at the time, and like the wild garlic love the fact that something so tasty can just be collected from 10 minutes away. As everyone knows, Wales can have a slightly colder and wetter climate than elsewhere in the UK! The mountain lamb therefore has an amazing fat covering which holds all the flavour and makes it taste amazing. The Wye Valley is a part of the country that's incredible for all soft fruits – everything seems to grow very well there. It's quite flat and quite protected from the rest of the country and they also have the history and infrastructure to produce what is produced. We use both forced indoor and outdoor rhubarb (which I personally prefer). As with the Wye Valley there is a long history of rhubarb growing in Yorkshire, they have the accreditation and you know that if it is marked with the DOP that the quality is high – many farms go back generations.